The Rocky Mountain juniper, Juniperus scopulorum, is one of eleven tree-sized juniper species found in the U.S., and has a wide but scattered range (left). As its name suggests, Rocky Mountain juniper grows here and there along the Rockies, all the way from New Mexico and Arizona up into Canada. The tree isn’t exclusively montane, however. 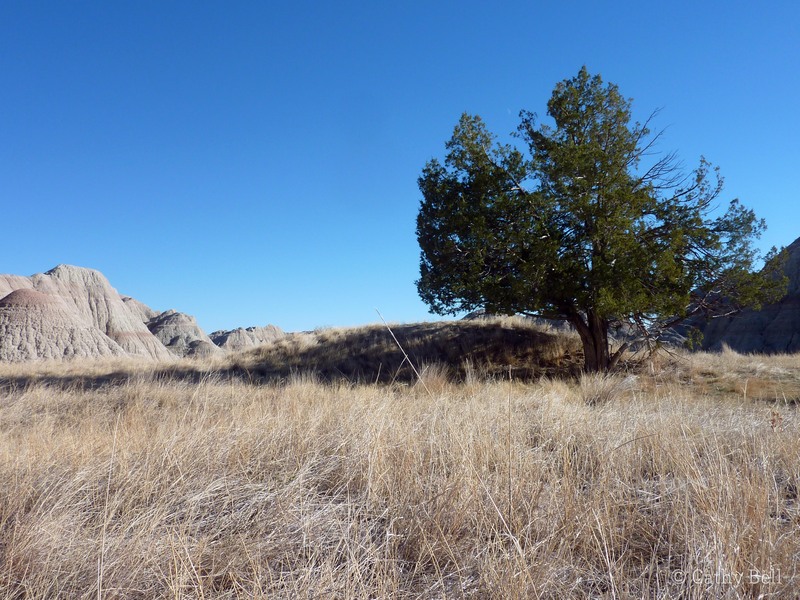 It also appears on the Great Plains and is one of the few trees that can be found in Badlands National Park. Here in the Dakotas, Rocky Mountain juniper often hybridizes with its close cousin, eastern red-cedar (Juniperus virginiana). In fact, the South Dakota junipers are more commonly called “cedars.” The headquarters and main visitor center at Badlands National Park are located at Cedar Pass. Several of the trees grow right in front of the Ben Reifel Visitor Center, and the nearby Cliff Shelf Nature Trail, a 1/2-mile loop, is one of the best places to get up close to junipers in the park. If they’re usually called cedars, why do I insist on referring to them as junipers? 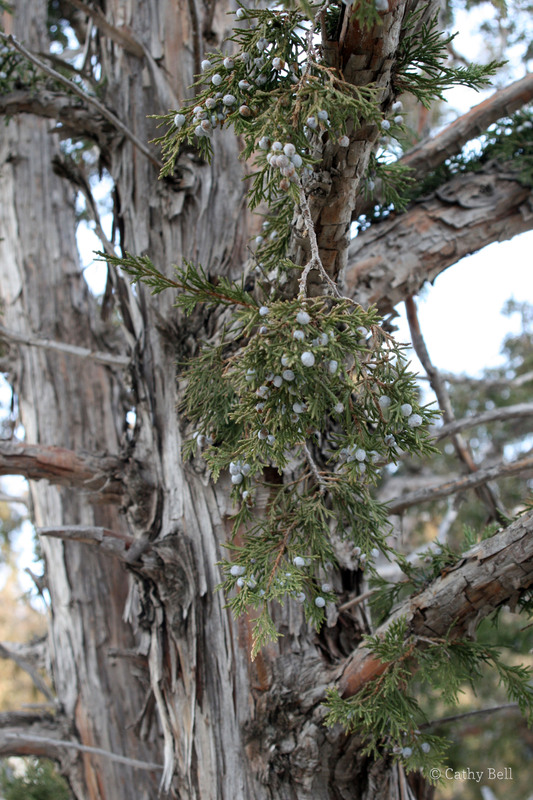 True cedars are botanically different from junipers, and red-cedar is actually a juniper. This is one of those cases where common names muddle matters, and where thinking in terms of scientific names helps: both Rocky Mountain juniper and eastern red-cedar, you may have noticed, are in the genus Juniperus. There are a few North American trees that we call cedars, like northern white cedar, a.k.a. arborvitae, a.k.a. Thuja occidentalis. But the true cedars are in the genus Cedrus and are native to Asia, the Middle East, and north Africa. Eastern white cedar (Thuja occidentalis) cones. Photo from Winnebago Conservation Photography. Why does it matter? In botany, one of the most consistent ways to figure out which plant species are most closely related is to compare their reproductive structures. Things like leaf shape are not reliable indicators of taxonomic relationships. The North American “cedars,” like our friend Thuja occidentalis, have little woody cones, shown on the right. The true Cedrus cedars have cute disintegrating cones much like those on a fir tree. And the Juniperus trees have a bluish, waxy “berry” that is actually a fleshy cone. I’m going to ask you to dig deep in your memory and think back to high school biology and the unit on plants. Remember learning about angiosperms and gymnosperms? The angiosperms are the flowering plants, and their seeds develop inside an ovary; these plants can produce real berries. The gymnosperms are the “naked seed” plants, ones that tuck the seeds in amongst the sheltering scales of a cone. Juniperus is a gymnosperm. Its cones just happen to have unusually beefed-up scales that fuse into a spherical thing that looks for all the world like a berry. 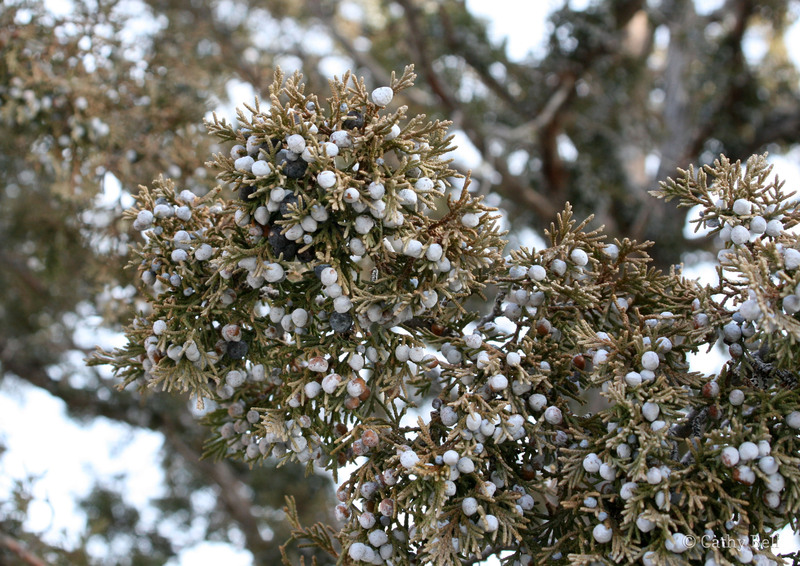 The bluish “berries” on a juniper aren’t berries at all. They’re fleshy cones. But you can call them berries–I won’t get mad. In fact, I’m going to refer to them as berries myself. Notice in the picture above that some of the berries are light blue, and others have darkened significantly. The dark ones are a year older. This is an important clue in trying to distinguish Rocky Mountain juniper from eastern red-cedar, because the cones of Rocky Mountain juniper need two years to mature. If you see two age classes of cone—as on the tree above—that’s strong evidence that you’re looking at Rocky Mountain juniper. Here’s something else fun. If you come to Badlands National Park and take a walk on the Cliff Shelf Nature Trail, you’ll notice that some of the junipers are heavily burdened with berries, while other trees have none. What gives? Rocky Mountain juniper is dioecious, which means that it has separate male and female plants! The berries only develop on the girl trees. The peeling bark and scaly evergreen leaves of junipers make them easy to recognize. And if you happen to see those bluish berries, you know you’re looking at a female tree! Junipers grow in clusters on slumps like Cliff Shelf and Deer Haven, but they also appear here and there as solitary trees on the prairie. A lone juniper on the prairie in Badlands National Park. Whether alone or in groups, junipers make good wildlife habitat. That lonely tree above had abundant deer sign around it, and appeared to be a favored bedding-down spot. Cliff Shelf and other concentrations of junipers attract not just deer but also birds, including wintering robins and Townsend’s solitaires, as I discussed in a previous post. The trees provide food for animals, especially in the winter months. They provide shelter at all times of year, serving as a much-sought-after windbreak. So, if you come to visit Badlands National Park, take a few moments to appreciate these hardy trees. They have an important role to play in the prairie ecosystem … and they’re super-cool in their own right. Lovely, lovely once again Cathy Bell. Oh, how you make me miss the junipers of the West! Their dioeciousness! Their fleshy cones! Not to mention their pungent, refreshing smell and endearing monotony on a long prairie drive. Somehow they give the landscape more dimension, dotting the rolling yellow hills near and far, and yet they are easy to get lost among because you can’t see beyond the next juniper, even though they are not all that close to each other. Thanks for inciting some nostalgia. Your photographs are also really nice. I think I need to go about life exclaiming, “Oh, the dioeciousness!” more often. Thanks for the kind words and for making me smile! I can’t believe I wrote a whole post about junipers without mentioning the smell! I’m so glad you mentioned that. Hahhaha!!! Of course I’d say that crazy word soooooo slowly (and incorrectly).